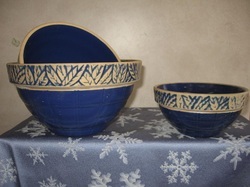 _Clay City Pottery is one of the few family potteries still making traditional stoneware. We have been making pottery for well over a hundred years. Now, the fifth and sixth generations of the Griffith family are working at the pottery. The way the clay is worked and the kiln is fired has changed very little since the beginning of Clay City Pottery. Modernization has come slowly and each generation has contributed its own values while preserving its heritage. The original Griffith family way of making the glazes, processing the local clays, and producing utilitarian stoneware is still in use today. We now use a method of forming the stoneware called "jiggering". It was adopted around 1900 and involves quite a bit of hands on work while preserving the look of our traditional wares. Our traditional stoneware is kiln fired for about 72 hours at a temperature of 2300 degrees Fahrenheit. This makes our stoneware very durable and dishwasher, oven, and microwave safe. Our glazes contain no lead and our stoneware is safe for all foods. Our stoneware looks great on your shelf, but we expect you to use it every day. Food stays warm and serves very well in our traditional stoneware bowls and casseroles. You can serve up cornbread, chicken casserole, or home baked pies just like Grandma used to make.